While driving his brother home after they worked late into the night at their church, Cleveland resident Anthony Wynn suddenly had a funny feeling. “We seen lights and right away we knew what it was,” he said. Moments later, a wrong-way driver slammed into their U-Haul on Interstate 71 in Cleveland. “It's like your life flashed right before your face,” Wynn said. Wynn was left bruised and in braces. Wrong-way crashes often have deadly consequences. 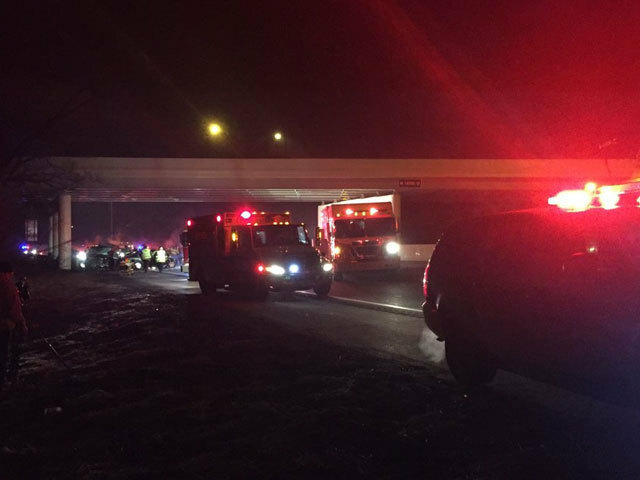 On Your Side Investigators found there were 21 fatal wrong-way crashes in Ohio in 2016, a 162 percent increase from 2015, when only 8 people were killed in wrong-way crashes. The victims included Kayla Coates, a 20-year-old college student. She was driving home on I-480 when she was hit head on by wrong-way driver. “The problem with these crashes is when they happen they're catastrophic,” said Matt Bruning, Press Secretary for the Ohio Department of Transportation. Concerned about the rising number of fatalities, Bruning said ODOT has taken steps to reduce wrong-way crashes. Bruning said the state agency has added additional wrong-way signs at some on-ramps in busy, urban areas. He also said some wrong-way signs have been lowered from seven to three feet off the ground. The reason: Most wrong-way drivers are drunk and Bruning said drunk drivers tend to look down. “We want to catch their attention with the lower signs,” he said. However, our On Your Side investigation found several states are doing even more to curb wrong-way crashes, including Arizona; California; Florida; Missouri; Rhode Island; Texas; and Wisconsin. Those states are testing what’s known as the Wrong-Way Driver Detection System, according to TAPCO, the company that created the system. Here’s how it works: When a driver enters an on-ramp the wrong way, the driver strikes a sensor activating flashing lights attached to wrong-way sign as selected on-ramps. The idea is to alert wrong-way drivers to their dangerous mistake before tragedy strikes. The system also alerts other drivers by posting a message on electronic traffic signs warning a wrong way driver may be heading towards them. Finally, the system also alerts police. Bruning said ODOT has “looked into” the system, but has no immediate plans to install it in Ohio. Bruning said ODOT mapped wrong-way crashes, but the data failed to reveal hot spots. “It’s not so much what to do, it’s where to do it,” said Bruning. “It like needle in a haystack,” he said. Bruning also said it would be an inefficient use of taxpayer dollars to install the system on all of Ohio’s more than 5,200 on-ramps. “You're talking millions of dollars to put them on every ramp and that's just not going to be possible,” he said. “You have to be prescriptive with where you put that technology,” Bruning said. However, Wynn said money shouldn’t matter. “We're talking human lives,” he said. “And I think human lives is a top priority,” said Wynn. Almost a year after his wrong-way accident, he’s still in a lot of pain. He said he wouldn’t wish what he’s been through on another driver. “I would never want to go through nothing like that again,” Wynn said.